More Than a Wee Bit of Movie Review Shenanigans! 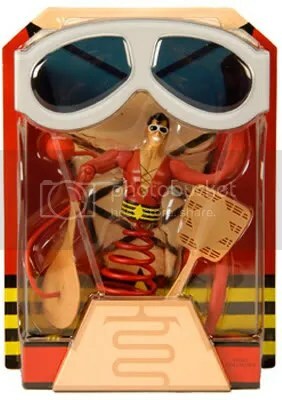 You are currently browsing the tag archive for the ‘Robot Chicken’ tag. Well, another Comic Con has come and gone, but your old friend Darby is here once again to give you all the news you need to know, and 100% Nerd Flu free. 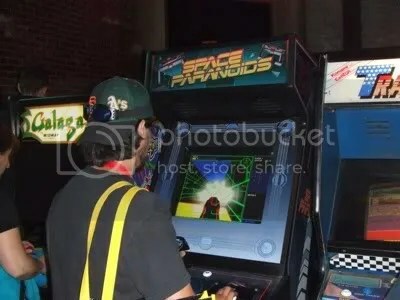 Tron: Legacy was back at the Con this year, and this time Flynn’s Arcade was also able to transport you into the game itself! After you had your fun playing free video games, you are escorted to Flynn’s workshop, where you get zapped into the game and find yourself at the “End of Line Club” a haven for rogue programs. This re-creation of a set from Tron: Legacy was one of the most impressive things at Comic Con this year. I almost didn’t want to leave the room. It was announced at this year’s Burn Notice panel, that there will be a straight-to-DVD Burn Notice prequel, starring Bruce Campbell as Sam Axe, and will tell the story of Sam’s last mission before Miami. Sadly, Robert Rodriguez announced Thursday, that 20th Century Fox will be releasing a sequel to this month’s new Predators incarnation. I know, not everyone disliked the new movie, but let’s be honest; it was crap, and I’m sure Predators: Electric Boogaloo isn’t going to be much better. At the end of the panel for Scott Pilgrim vs. The World, director/co-writer Edgar Wright announced that a surprise secret screening was about to take place. 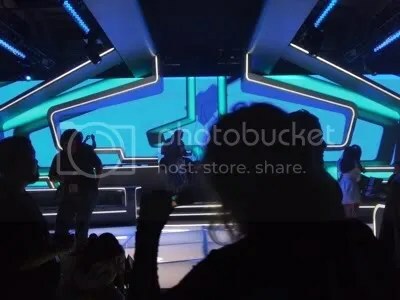 He then took a select few of the audience members from Hall H, and lead them Pied Piper style through the streets of San Diego to a theater not far from the convention center. Let me just say, that this is hands down the best movie of the summer! A review will be up here closer to the release of the movie, but take my word for it and buy your tickets now! AMC‘s new series The Walking Dead, based on the Image comic, definitely had the biggest presence at the Con this year. You couldn’t go any where without seeing a horde of zombies, or footage from the upcoming show, stopping people in their tracks… Literally. At the panel on Friday we got to see some bloody amazing footage, and I mean bloody in both senses of the word. The cinematography on this show is going to blow you way. The sparkly vampires and teenage werewolves have had their time in the sun, well maybe not the vampires, but I do believe it’s about high time for the zombies. Long live the zombies! Can you say that about the undead? I was able to attend the press event/panel for the new Saw 3D, or Saw VII whichever one you prefer, and got to see the first eight minutes of the movie. 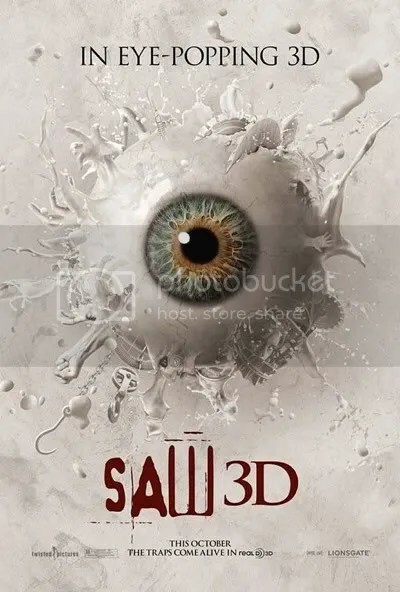 They also unveiled the new eye popping poster, and also announced that this will be the final chapter in the Saw series. After thousands of people, along with Ralph and myself (Ralph was out there much longer than I), camped out all night just for the chance of getting in to Hall H for the Green Lantern panel, it was finally 11:45AM and thanks to Ralph and Lenny we made it in! On hand for the Q&A was Mr. Hal Jordan himself Ryan Reynolds, Blake Lively, Mark Strong, Peter Sarsgaard, and directory Martin Campbell. The panel wasn’t overly flashy, but we did get to see a few minutes of footage in the form of a somewhat trailer. It’s less than a year away, but I think I might just have to get in line now! 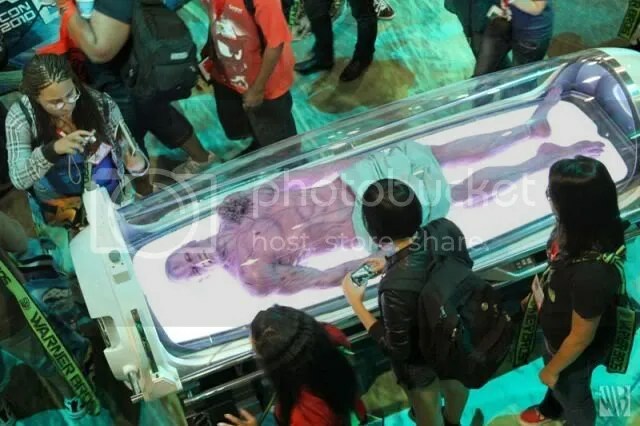 At the Warner Bros. booth, there was also a floor display of Abin Sur’s body. At the Pirates of the Caribbean: On Stranger Tides panel, the audience received a special message from Captain Jack Sparrow himself! Does this mean we can stop calling it a trilogy? Okay, so here’s where Saturday gets a little pear shaped. Two men started arguing over space, or lack there of in Hall H, just after the Resident Evil: Afterlife panel, and just before the Paul panel. It was at this point, that of the one guys ends up stabbing the other guy near the eye with a pen. When news of the event quickly made its way around the Con, the only thing that shocked me was that it doesn’t happen more often. You’ve got thousands of antisocial people all huddled together with other antisocial people, add to that most haven’t eaten or slept in days, and at some point the nerd-rage is going to fly. The best part of all this was the costumes that followed on Sunday. Thanks to the amazing Jon Favreau, for the first time in Comic Con history, Harrison Ford graced the Con with his presence, and in handcuffs no less. The handcuffs could have had two meanings; 1) that’s what it took to get him to his first Comic Con, or 2) it was trying to make light of the stabbing that took place earlier. Either way, the crowd erupted when they saw Han Solo being lead to the stage by security. 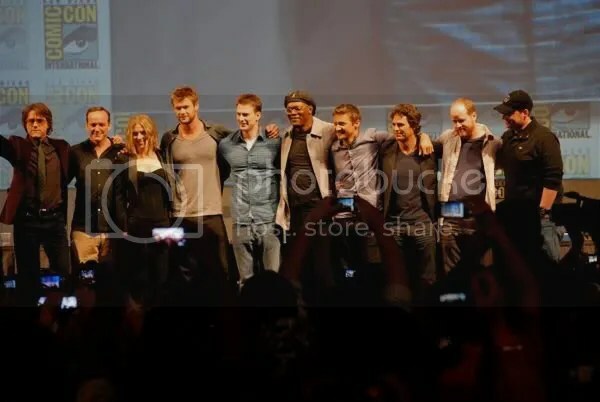 For the first time ever, the cast of the up-coming Avengers movie were assembled in one place, and that place was Comic Con! The video says it all! But it’s not just all about the movies at Comic Con. 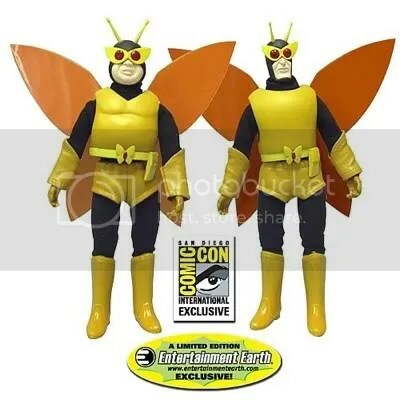 One of the best reasons to go to Comic Con is to get your hands on the exclusive toys and action figures only available at the Con… Well that is until they’re put on eBay for five times the original price. This is just a few of them; there really are way too many to list. This one was a “Must Have” for me this year! These Gentle Giant Comic Con exclusives, are mini-busts of the Attack of the Show hosts Kevin Pereira & Olivia Munn. 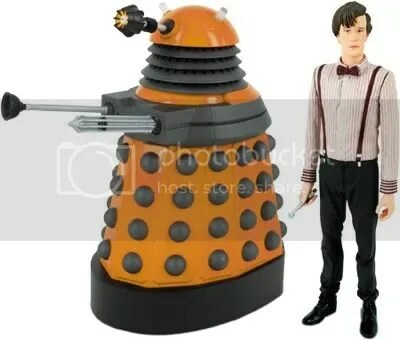 This years Doctor Who figure is a two-pack of the Eleventh Doctor and one of those lame Dalek redesigns. These old school action figure dolls of Henchmen 21 and 24, were almost impossible to get. 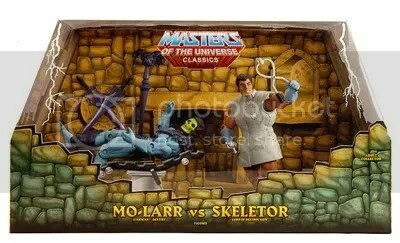 By far the funniest exclusive at the Con this year, based on the Robot Chicken skit, this two-pack features for the first time ever Mo-Larr and a gapped toothed Skeletor. One last thing before I go. Every year the studios at Comic Con make these giant bags for people to carry their stuff around in while at the Con. Well the best bags this year, without a doubt, go to the SyFy Channel. 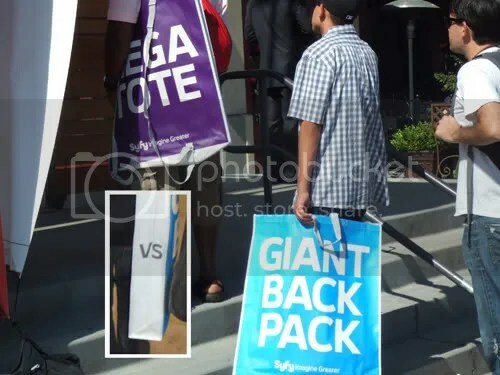 One side of the bag reads “Mega Tote,” and the other “Giant Backpack.” But the thing that makes it so great is that in the fold of the bag it reads “vs.” You’ve got to love that! Well, that does it for another Comic Con, but Comic Con 2011 will be on July 21st to the 24th next year, so start making your plans now.